The devil's gate in Southern Wyoming opened by Jake Talley. Dean: Did you read anything else off the tablet before you stashed it? Kevin: I read stuff about how to close the Gates of Hell. Forever. Kevin: Banish all demons off the face off the Earth. Lock them away forever. That could be important, right? A Hell Gate, also known as a Devil's Gate, is a portal between Hell and Earth which when opened allows demons passage to Earth. There is a tablet which contains instructions on how to close all Hell Gates. Devil's Gate Reservoir: Bill Harvelle and John Winchester were hunting a Hellspawn at the Hell Gate in Reservoir when Bill was killed. Devil's Gate in Clifton: John Winchester once went missing while on a hunt near the gate. Devil's Gate in Wyoming: There is a Hell Gate at Fossil Butte Cemetery which Samuel Colt had surrounded with a huge devil's trap. The trap is 100 square miles across in southeastern Wyoming. There is a church at each point and the sides of the pentacle are made of iron railroad lines. Azazel plans to open the Gate and use beings from Hell as soldiers in a war against humanity. As the devil's trap prevents him from getting to the Gate, he uses Jake Talley - one of the Special Children to cross into it and unlock the Gate. He does this using the Colt as the key. When the door is open a blast of energy lights up the surrounding railways and blows up at least one of the churches, which weakens the devil's trap and allows the Yellow-Eyed Demon to enter. Hundreds of beings, including demons and spirits, escape from Hell before Bobby and Ellen manage to close the gate again. 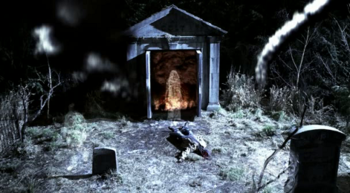 John Winchester is among those to escape through the gate. Jack is tricked by Asmodeus into releasing the shedim. Devil's Gate in Purgatory: It is revealed in 8.19 Taxi Driver that there is a "rabbit hole" to Hell located in Purgatory. Rogue reapers such as Ajay use it sneak mortals and souls in and out of Hell. 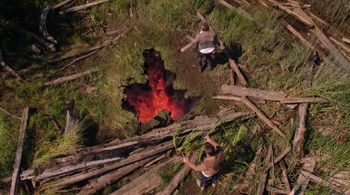 Sam uses it to rescue Bobby Singer's soul from Hell as part of the second trial. Devil's Gate in Jasper, Wyoming: Opens to the prison of the shedim. In 13.02 The Rising Son, the last of the Princes of Hell, Asmodeus, tries to use the Nephilim Jack Kline to open it and release the shedim, telling him that he was rescuing a troop of God's soldiers who were trapped in a distant cavern in Hell. He was stopped by the Winchesters and the prophet Donatello Redfield. The Devil's Gate is mentioned in John's Journal as well, describing the legend of "a place where unimaginable evil emanates from creatures too wicked for the Pit to hold." This page was last edited on 20 October 2017, at 11:33.